Michael Nelson's headed goal sealed Norwich's promotion to the Championship courtesy of victory at Charlton. Ironically, Nelson's winner - from a Simon Lappin corner - was scored on the same ground on which the Canaries were relegated to League One a year ago. But Norwich had keeper Fraser Foster to thank for the win after he produced a string of superb saves. He twice denied Addicks striker Nicky Forster and also superbly saved shots from Deon Burton and Nicky Bailey. After dropping points in their two previous matches against MK Dons and Leyton Orient, the Canaries were expected to have to wait longer to secure their return to English football's second tier at the first time of asking. However, defeat for second-place Leeds at Gillingham and the inability of the other promotion-chasing sides to win this weekend meant Paul Lambert's side were fully rewarded for a season in which they have topped the table since late January. Their campaign has been transformed by Scotsman Lambert. He replaced Bryan Gunn following their 7-1 mauling at home to Lambert's Colchester on the opening day of the season. Since his appointment on 18 August, Norwich have lost just nine of their 47 matches in all competitions, winning 30 with eight draws. "The lads have been absolutely brilliant. Every game they've given me effort and top-class performances, backed by the crowd who are just phenomenal. "It's a phenomenal day for everybody at the football club, coming back to a ground where they got relegated last year. "We had three big players out as well so I'm absolutely delighted, over the moon for everybody connected with the club." "I thought we couldn't have done much more to win. "We dominated the game for long periods and did everything but put the ball in the back of the net. "I couldn't ask for any more from the lads." 90:00+5:40 The referee ends the match. 90:00+4:47 The ball is sent over by Frazer Richardson, Adam Drury manages to make a clearance. 90:00+4:10 Kyel Reid gives away a free kick for an unfair challenge on Russell Martin. Free kick taken by Fraser Forster. 90:00+3:28 Frazer Richardson takes the free kick. 90:00+3:28 Booking Michael Spillane booked for unsporting behaviour. 90:00+3:24 Michael Spillane gives away a free kick for an unfair challenge on Lloyd Sam. 90:00+1:48 The ball is swung over by Lloyd Sam, free kick awarded for a foul by Sam Sodje on Fraser Forster. Fraser Forster restarts play with the free kick. 90:00+0:49 Kyel Reid gives away a free kick for an unfair challenge on Russell Martin. Fraser Forster takes the direct free kick. 90:00+0:21 Stephen Elliott concedes a free kick for a foul on Christian Dailly. Darren Randolph takes the direct free kick. 90:00+0:06 Kyel Reid produces a cross, clearance made by Michael Nelson. 89:53 Free kick awarded for an unfair challenge on Christian Dailly by Stephen Elliott. Direct free kick taken by Christian Dailly. 89:21 Lloyd Sam produces a right-footed shot from just outside the area that goes harmlessly over the target. 88:20 The ball is sent over by Jonjo Shelvey, Unfair challenge on Fraser Forster by Deon Burton results in a free kick. Fraser Forster takes the free kick. 87:29 Jonjo Shelvey crosses the ball. 86:33 Jonjo Shelvey sends in a cross, Sam Sodje produces a header from inside the area that goes over the crossbar. 85:55 Substitution Stephen Elliott replaces Chris Martin. 85:24 The ball is sent over by Lloyd Sam, clearance by Stephen Hughes. 84:39 The ball is crossed by Jonjo Shelvey, save made by Fraser Forster. 82:07 Substitution (Charlton) makes a substitution, with Jonjo Shelvey coming on for Nicky Bailey. 80:15 The ball is swung over by Kyel Reid, Michael Rose manages to make a clearance. Lloyd Sam delivers the ball, comfortable save by Fraser Forster. 79:50 Nicky Bailey gives away a free kick for an unfair challenge on Darel Russell. Darel Russell restarts play with the free kick. 77:35 Chris Martin concedes a free kick for a foul on Therry Racon. The free kick is delivered right-footed by Gary Borrowdale from left channel, clearance by Michael Spillane. 77:24 The ball is sent over by Nicky Bailey, Darel Russell manages to make a clearance. 76:59 Michael Rose crosses the ball. 76:11 Booking Fraser Forster is shown a yellow card. Correction - 75:42 Shot by Nicky Bailey from deep inside the penalty area misses to the right of the goal. 75:42 Shot by Nicky Bailey from deep inside the penalty area misses to the right of the target. 75:30 The ball is crossed by Frazer Richardson, clearance made by Gary Doherty. 74:05 A cross is delivered by Gary Borrowdale, clearance by Michael Spillane. Correction - 73:48 The ball is delivered by Lloyd Sam, clearance made by Michael Spillane. 73:48 Lloyd Sam sends in a cross. 73:30 Darel Russell concedes a free kick for a foul on Deon Burton. Therry Racon restarts play with the free kick. 72:15 Kyel Reid crosses the ball, save by Fraser Forster. 71:42 Substitution Jose Vitor Semedo leaves the field to be replaced by Kyel Reid. 69:50 Effort from 20 yards by Deon Burton. Save by Fraser Forster. 67:35 The ball is delivered by Nicky Forster, save by Fraser Forster. Corner from left by-line taken by Frazer Richardson. 67:01 The ball is swung over by Frazer Richardson, Stephen Hughes makes a clearance. 65:20 Nicky Forster delivers the ball, blocked by Gary Doherty. Inswinging corner taken right-footed by Frazer Richardson, save by Fraser Forster. Christian Dailly takes a shot. Save by Fraser Forster. 64:07 Centre by Frazer Richardson, clearance made by Adam Drury. Inswinging corner taken by Gary Borrowdale, Headed effort from inside the area by Sam Sodje misses to the right of the goal. 63:53 The ball is sent over by Nicky Bailey. 63:01 Substitution Michael Rose joins the action as a substitute, replacing Oli Johnson. 62:28 Lloyd Sam produces a cross, Deon Burton takes a shot. Save by Fraser Forster. 61:52 Therry Racon takes a shot. Fraser Forster makes a save. 60:35 The ball is sent over by Deon Burton, Nicky Forster has a headed effort at goal from close in which goes wide of the left-hand upright. 59:15 Nicky Bailey fires a strike on goal direct from the free kick, Fraser Forster makes a brilliant save. 59:15 Booking Stephen Hughes receives a yellow card. 59:00 Stephen Hughes challenges Lloyd Sam unfairly and gives away a free kick. 51:42 A cross is delivered by Jose Vitor Semedo, clearance made by Gary Doherty. 51:01 The ball is crossed by Frazer Richardson, clearance by Michael Nelson. 49:00 A cross is delivered by Nicky Forster, Deon Burton takes a shot. Fraser Forster makes a fantastic save. 48:14 Therry Racon takes a shot. Darel Russell gets a block in. 48:06 Gary Borrowdale produces a cross. 47:41 Inswinging corner taken by Gary Borrowdale from the right by-line, Michael Nelson makes a clearance. 47:27 Gary Borrowdale crosses the ball. Correction - 47:16 Centre by Frazer Richardson, Michael Nelson makes a clearance. 47:16 Centre by Frazer Richardson. 45:20 Foul by Chris Martin on Sam Sodje, free kick awarded. Free kick taken by Darren Randolph. 45:00+2:15 The ref blows to signal half-time. 45:00+1:42 Lloyd Sam produces a cross, save made by Fraser Forster. 45:00+1:34 Nicky Forster produces a cross. 45:00+0:30 Inswinging corner taken by Frazer Richardson from the left by-line, Nicky Forster concedes a free kick for a foul on Fraser Forster. Fraser Forster takes the direct free kick. 45:00+0:07 The ball is sent over by Lloyd Sam, clearance made by Stephen Hughes. 44:55 Deon Burton fouled by Michael Spillane, the ref awards a free kick. Nicky Bailey restarts play with the free kick. Correction - 43:55 Shot by Nicky Bailey from 12 yards. Save by Fraser Forster. 43:55 Nicky Bailey takes a shot. Fraser Forster makes a fantastic save. 43:00 Substitution Deon Burton on for Akpo Sodje. 42:29 Nicky Bailey produces a cross, Michael Nelson manages to make a clearance. 41:35 The ball is sent over by Therry Racon. 41:02 Gary Doherty gives away a free kick for an unfair challenge on Akpo Sodje. Frazer Richardson crosses the ball from the free kick right-footed from right channel, clearance by Michael Nelson. 39:40 Darren Randolph takes the free kick. 39:40 Booking Adam Drury is shown a yellow card for unsporting behaviour. 39:27 Free kick awarded for an unfair challenge on Nicky Bailey by Adam Drury. 38:43 The ball is sent over by Adam Drury, clearance made by Gary Borrowdale. 37:56 A cross is delivered by Michael Spillane. 37:27 The ball is crossed by Frazer Richardson, save by Fraser Forster. 37:03 Frazer Richardson produces a cross, save by Fraser Forster. 36:02 Lloyd Sam crosses the ball, Adam Drury gets a block in. Inswinging corner taken from the right by-line by Gary Borrowdale. 35:23 Nicky Bailey has an effort at goal from outside the area missing to the wide left of the goal. Correction - 33:42 Assist on the goal came from Simon Lappin. 33:42 Michael Nelson provided the assist for the goal. 33:42 GOAL - Michael Nelson:Charlton 0 - 1 Norwich Michael Nelson finds the back of the net with a headed goal from inside the six-yard box. 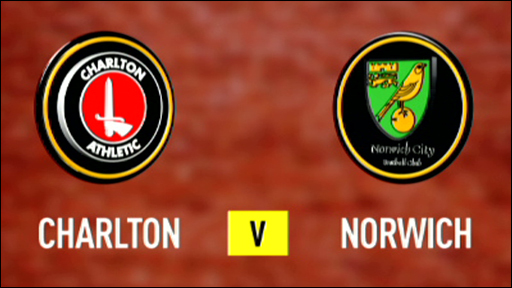 Charlton 0-1 Norwich. 31:05 The assistant referee flags for offside against Nicky Forster. Free kick taken by Fraser Forster. 29:28 Jose Vitor Semedo concedes a free kick for a foul on Chris Martin. Adam Drury takes the direct free kick. 28:52 Russell Martin delivers the ball, Strike by Stephen Hughes from inside the six-yard box clear the bar. 25:01 The ball is crossed by Frazer Richardson, comfortable save by Fraser Forster. Correction - 22:59 The assistant referee signals for offside against Stephen Hughes. Darren Randolph takes the indirect free kick. The ball is swung over by Adam Drury. 22:59 The offside flag is raised against Stephen Hughes. Darren Randolph restarts play with the free kick. 21:05 Inswinging corner taken left-footed by Gary Borrowdale played to the near post, Russell Martin makes a clearance. 20:36 Nicky Bailey takes a shot. Save by Fraser Forster. 18:54 Free kick awarded for an unfair challenge on Nicky Forster by Michael Nelson. Direct free kick taken by Jose Vitor Semedo. Effort on goal by Gary Borrowdale from outside the area goes harmlessly over the bar. Correction - 18:14 The ball is swung over by Nicky Forster. 18:14 Nicky Forster crosses the ball. 17:45 The ball is swung over by Russell Martin. 17:10 Corner taken by Gary Borrowdale from the right by-line, Fraser Forster makes a save. 15:06 Free kick awarded for a foul by Jose Vitor Semedo on Chris Martin. Free kick crossed left-footed by Adam Drury, save made by Darren Randolph. 12:17 Unfair challenge on Michael Spillane by Akpo Sodje results in a free kick. Fraser Forster restarts play with the free kick. 10:52 Free kick awarded for a foul by Russell Martin on Jose Vitor Semedo. Gary Borrowdale restarts play with the free kick. 9:59 Adam Drury sends in a cross. 6:58 Foul by Chris Martin on Akpo Sodje, free kick awarded. Free kick taken by Christian Dailly. 6:18 Akpo Sodje challenges Michael Nelson unfairly and gives away a free kick. Fraser Forster takes the free kick. 5:27 Foul by Nicky Forster on Stephen Hughes, free kick awarded. Fraser Forster takes the free kick. 5:15 Lloyd Sam sends in a cross, Michael Spillane manages to make a clearance. 3:28 Chris Martin concedes a free kick for a foul on Frazer Richardson. Frazer Richardson crosses the ball from the free kick right-footed from right channel, Fraser Forster makes a comfortable save. 2:07 The ball is swung over by Nicky Bailey. 0:45 Corner taken by Gary Borrowdale from the right by-line played to the near post, clearance made by Simon Lappin.